Now that the chess season is over, some may want to know where to go to for more practice & tournaments. 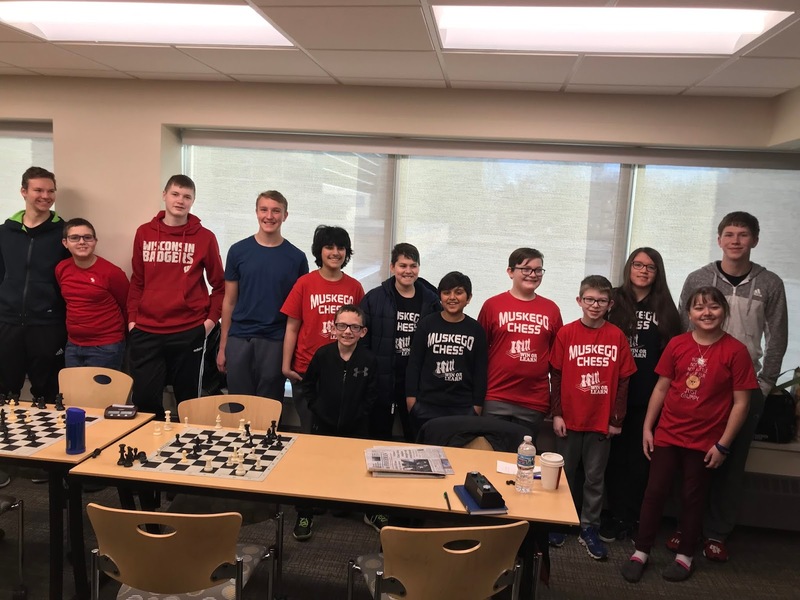 April 27 - IAC is having a Scholastic Tournament at Medical College of Wisconsin "Alumni Center"
SouthWest Chess Club - Open to all levels. Thursday nights at 6 pm, Hales Corners Police Station. Don't forget in June & July we have "Free Play" at the Library & will be at Jamming on Janesville. Have a good summer & keep practicing! As Chess is winding down for the season, Dan & I are busy trying to figure out the summer schedule & how to promote the club. One way we do this is by having "free play" at the Library on Wednesday nights from 6:30 pm - 8 pm. Free play is open for anyone & everyone. We need help with volunteers to just "watch" the room & make sure the kids don't get too wild. You don't need to know how to play chess. The chessboards will be at the library already. So while you're starting to make your summer plans, please keep Wednesday nights open (June19, June 26, July 10, July 17, July 24 & July 31). We'll also be at Jammin on Janesville (Friday, June 7) & will need help running the booth. 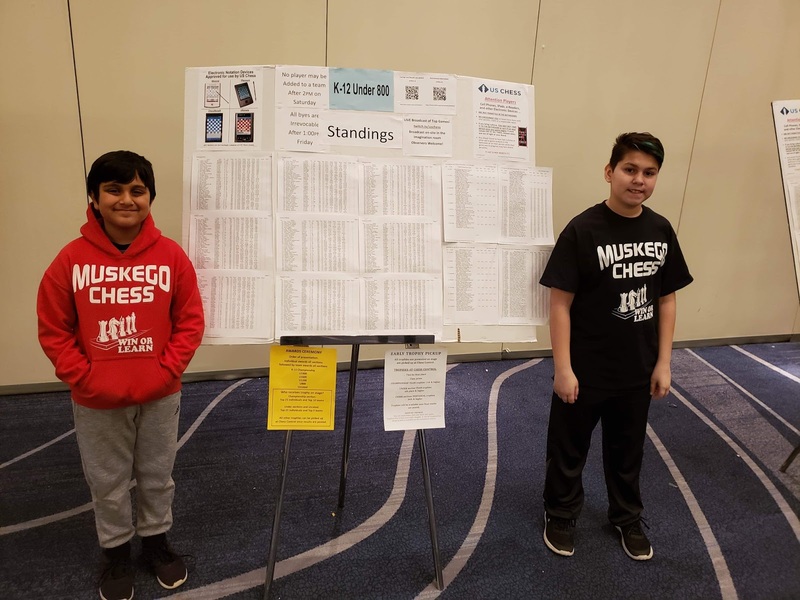 While Josh & Rishi were battling down in Schaumburg at Nationals, the MSCC brought 9 other players to the WSCF Annual Grade Level Tournament, held at the UWM Union. 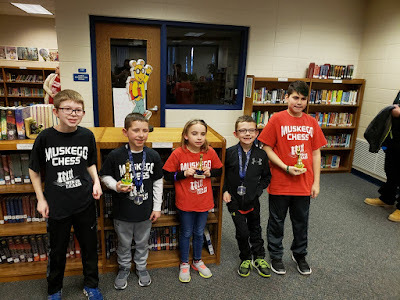 Travis (3rd grade) and Tyler (1st grade) were in their first tournament ever, and did a great job learning and getting better each round, getting at least one win each. 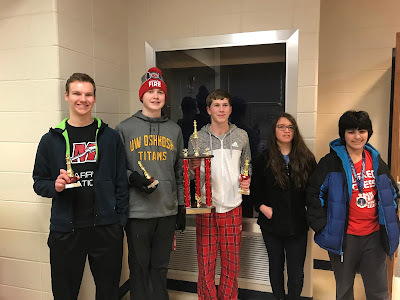 Brothers Alex (6th), Matthew (3rd) and Ryan (1st) were in only their 2nd tournament with the club and had some nice wins of their own. Charlie (2nd) is also in his first year of tournaments and continues to play better, getting a couple of nice wins. Some of our more experienced players had some very good success - Anthony took 1st place in 3rd grade with 4.5/5! 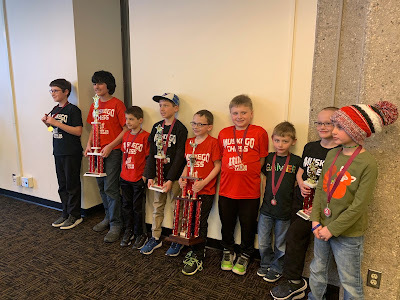 Owen took 7th place, also in 3rd grade, with 4/5, and Steven took 3rd place in 8th grade with 4/5. The 3rd grade team of Anthony, Owen, Matthew and Travis took the first place team trophy for 3rd grade! All of our players represented the club well with their sportsmanship and efforts throughout the day! Congratulations to Rishi & Josh for attending the High School Nationals in Schaumburg IL this past weekend. This huge tournament had almost 1,700 players in 7 different rated sections. Rishi & Josh played in the U800 section, and played 7 games over 3 days, finishing with 4 and 3.5 points respectively. This is a huge accomplishment in a highly competitive section of players from around the country - Well done! Rishi also gets his red wristband for this accomplishment, which is very well deserved ! The MSCC had a nice close tournament this past weekend in New Berlin at Elmwood School. It was a very large tournament - over 220 players - and we had a great time! Alex T and Alex K also were in their first tournament and played some nice games, also taking notation. This was a very competitive section and a number of our players stepped up to the challenge of playing in this section instead of K6! Josh led the way with 4/6 wins and a 9th place finish! Close behind was Anthony, Rishi, Lucas, and Luke. Lucas and Rishi took an additional class award for finishing high in their respective rating classes. The open section was very competitive as well and made for a long day - 5 rounds of G45. Will led the way with 3.5/5 wins and a 5th place finish! 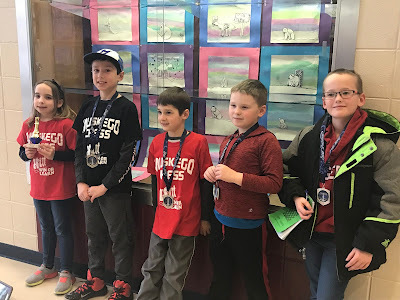 Alyssa, Aaron and Noah also had some very nice wins, as did Steven. Noah and Aaron also took awards for finishing high in their rating class. The team of Will, Alyssa, Aaron and Noah took home the 1st place team trophy for MHS, just edging out a very strong Eisenhower team! Nice job to our whole club for representing the MSCC very well!